Welcome to my Flashback Movie Challenge. The goal here is to re-watch movies from your youth that you loved back then and see if you and your “young self from yesteryear” can agree on your opinion of this movie or whether years of new perspectives have changed those feelings. If you would like to participate in this, feel free to shoot me an email (rob@movierob.net) with your review so I can post it. It’s very important that you show the similarities or differences between the you of now and the you of then. Good luck to all!!!! I look forward to seeing how we all fare. 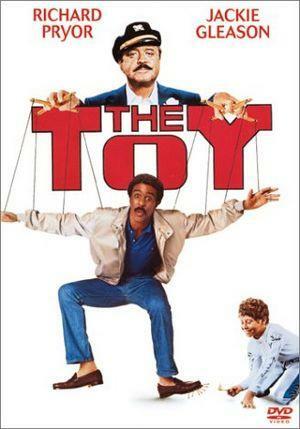 To continue with my challenge, I present you with my review of The Toy (1982), this movie was another one of my favorites growing up and I have very fond memories of it. Now, on to the review…..
Brief Synopsis – A spoiled rich kid gets his father to hire a black man as his friend for a week. My Take on it – This is another movie that I saw so many times as a kid and have great memories of enjoying it. Watching it now, I realize that this move is multi-layered and gives us a great message about child-adult relationships while at the same time entertains us with some very funny scenes. Richard Pryor was in his hey-day at the time and his pairing with the great Jackie Gleason is just genius. Gleason is great as the straight man for most of the jokes. My favorite scenes are the ones with the Piranhas and the party scene at the end. Bottom Line – Great premise and message for kids and adults alike. Excellent pairing of Pryor and Gleason. Overall, I’m very glad I re-watched this. I now understand it on a different level than I did as a kid and enjoy it for its message more than for it’s jokes which shows that as we grow up, we can appreciate movies for different reasons than we did as kids without it diminishing the entertainment value. I think that in this case, once again, my younger self and I agree that this is a very enjoyable movie, but for different reasons.